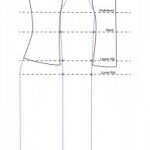 There are several ways you can approach the shift part of a dress for a project like this. By far, the easiest is by starting with a full pattern that you’ve adapted to skim your body. This is important. There’s nothing worse than looking like an overstuffed sausage when you should feel comfortable and self-assured. I made the pattern for this dress from a bustier from Vogue, adapting it to my exact measurements then extending it downwards. My first attempt with the pattern resulted in a cute 6-pieces A-line black jerset dress with vague industrial leanings, for going to concerts. It has a straight cleavage and looks a lot like a pinafore, but it’s light and comfortable and, in extremely stuffy environments like clubs and concert arenas, works a treat. You can read how I created this pattern in this post. My second attempt consolidated the 6 pieces into 3 (one front, two back), and resulted in my black and silver fustan raqs shown in the flouncy sleeves post. My third attempt was this dress, and the fourth has been turned into a vaguely 50s style off the shoulder dress again in black cotton jersey. So it’s well worth investing the time to get the pattern right, as you can use it for several things, and the more you use it and refine it, the better (and easier) it will be to put together a great costume or outfit. For this one, I also wanted a bit more of a siren shape, so when drafting I made the sides of front and back flare starting above the kee, and added a semi-circle of fabric starting right under the end of the zipper (end of my bum) to increase the siren effect. The foiled fabric proved to be a total nightmare to sew with the straight stitch machine, and I ended doing most of the work on it on the overlocker, simply because it wasn’t bunching and making holes in the fabric every other stitch. Let this be a lesson to you: when working with vynils or knits, ALWAYS USE THE RIGHT TYPE OF NEEDLE (I was) and ALWAYS MAKE SURE THAT YOUR TENSION IS RIGHT (I did). And if that fails, try using a different bobbin; sometimes the tension on the bobbin itself isn’t right, be it because it went wrong during manufacturing, or because you’ve been sewing by hand a lot and rewound the bobbin yourself and ended with uneven tension on it. So another lesson to keep in mind: always have a separate bobbin to sew by hand, if you can. Needless to say, my problem ended being a rogue bobbin, and once sorted, it was much easier to deal with. Also, when working with foiled fabrics, which are rather popular for costumes at the moment, remember that the foil effect can get easily damaged if you stitch it too much, or poke and prod at it. Like vinyl or leather, the more you prod it, the weaker it becomes, so keep that in mind when working with it and try to keep pins to a minimum. 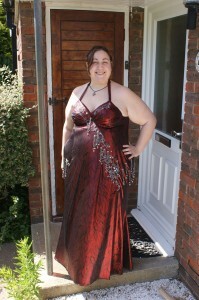 Assembling the dress was done pretty quick, adding the bra was the tricky part but that always is. 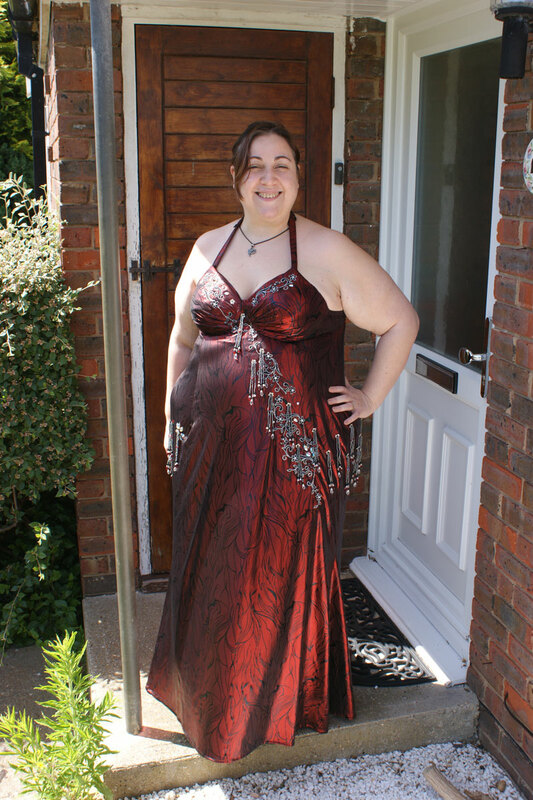 All I can recommend if you don’t have a dress form to help you with this stage is to either find someone you trust to help you pin both of them together while you’re wearing them, or to do what I did and go for a stuffed cushion to double as your torso. The cushion has the advantage that you can pin the fabric to it and it won’t complain, and this can make it easier to assemble both parts. I also added more gross-grain ribbon along the top’s inside to prevent the fabric from stretching and dropping, and to help with the overall structural integrity. To set up the decoration, it helps if you’ve got an idea of what you want to achieve. I knew straight away before even starting that I wanted something scroll-like and asymmetrical, so I looked around for potential sources, then I did a mock up in Photoshop first, then laid the dress down with the pillows behind it and tried arranging the parts I had until I got something I was pleased with. 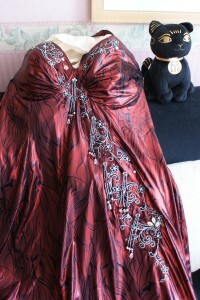 As you can see by the picture, while the decorations are fairly monochrome, there’s plenty of different pieces: the black and silver applique, tear-shaped faceted AB crystals, round AB crystals on settings, tear-shaped faceted smoke crystals, flower-shaped metallic silver beads and even the odd seed bead to anchor flowers that don’t have the tassels. I added the decorations without a backing on the bra, as there were several thick layers already there. For the dress itself, I used a layer of medium interfacing on the inside for the appliques, double layered when I was creating the crystal flowers. The tassels have a small square of interfacing folded in 4, I knot all three threads of the tassels to it, then finish it all off with a point of fabric-friendly glue to keep the knots tight. I’ve used this method for both fustan raqs I’ve done so far and I haven’t had any tassel falling off the fabric, after several uses, so I suspect I must be doing something right! Trim the interfacing on the inside after you’re done. I’ve also used liberally some flower-shaped beads/sequins which I used to anchor the tassels, I rather liked the effect I got this way. My one main complaint right now is that the crystals I used in settings have all been falling pretty regularly, and I’m wondering whether I wouldn’t have been better off getting bigger sew-on crystals and adding those. I also lament not buying all the silver and black appliques at once as the seller only had a limited amount and apparently won’t be getting any more of them any time soon, so I had to use the few I could get to set up the strong diagonal shape and just compensated the hip area by having plenty of tassels, with some focal points created by flowers made using petal-shaped AB crystals. Eventually I would like to add more silver and black scrolls around the hip area but that won’t happen unless I can find the right pieces again. Overall this was a fun project, the results were stunning and I got plenty of compliments on the dress. 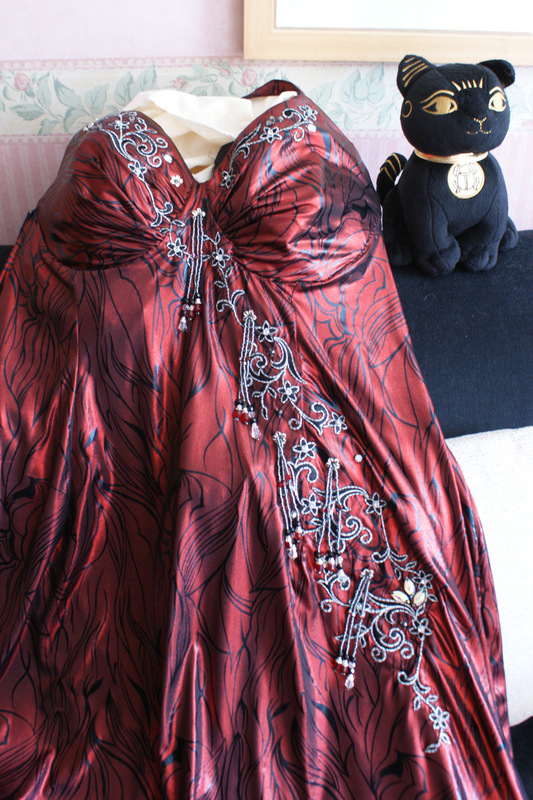 I did add double-layered flouncy sleeves, with the armband in this fabric, and the flounces made in black and red chiffon. They add a great effect to it. As for the down-sides, when looking at the photos from the events and performances later on I did notice that the halter neck was really causing the back to drop too much, despite the gross-grain ribbon. My only options here are to tighten up the back (not likely) or to change the halter neck into either straight or cross-backed straps, which is what I will be doing. And I will need to reduce the semi-circle at the back to a quarter or third circle, as the extra flare is a bit too much and gets under your feet when dancing. Hopefully these are all things I will be able to address before tackling next project. Fustan Raqs in Red, part two: Eyecandy!